With over twenty five years experience and literally thousands of satisfied customers, Kitchen Kraft are one of the most experienced kitchen companies in the North West. From traditional to contemporary to stunning curves, we have it all. 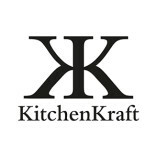 Having... been established since 1989 and with thousands of satisfied customers, Kitchen Kraft are one of the most experienced luxury kitchen companies in the North West and Cheshire. From traditional to stylish and modern,we have a kitchen range to suit your taste and also your budget.